This Facebook post is a perfect illustration of my philosophy. Life is not about hording and keeping what we have received. Life in all its fullness only comes through being open and generous. Caring, sharing and giving makes life worthwhile. A truly thankful heart is one that wants others the enjoy the same gifts we have received. Sharing, even a meager crust, is far better than eating a banquet alone. 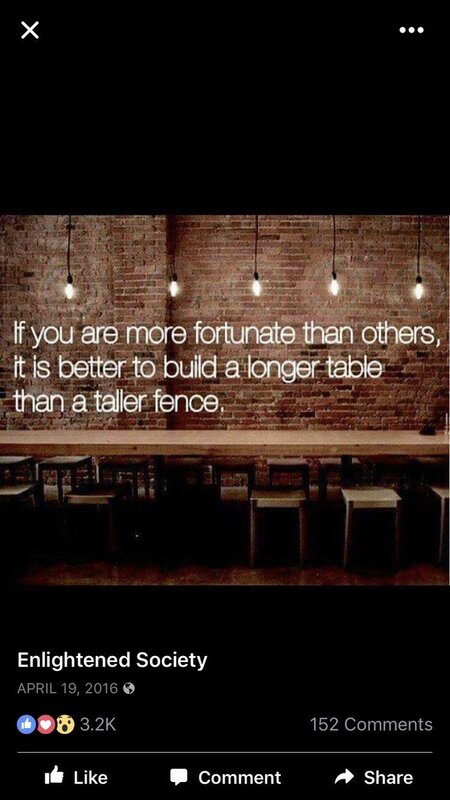 We don’t need thicker walls and taller fences. We need longer tables. This entry was posted in Hunger & Poverty, News & Views, Quotes and tagged blessing, caring, compassion., crust, Enlightened Society, fences, fortunate, generosity, giving, greed, heart, hording, life in all its fullness, openess, philosophy, sharing, tables, thankfulness, walls on June 6, 2017 by Ray Buchanan. Many would like the poor to keep on saying that it is God’s will for them to live that way. Jesus said that he came so that we all might know life in all its fullness. That is found in the tenth chapter of John’s Gospel. Life in all its fullness cannot be achieved when one lives in constant fear of hunger. Living in the shadow of starvation, watching your children live stunted and wasted lives, cannot be what Jesus intended when he talked about life in all its fullness. Poverty and hunger cannot be of God. These words of Oscar Romero, the martyred Archbishop of El Salvador, remind us that God’s will is for all his children to be happy. Faithfulness to the gospel calls for Christians to work toward achieving a world where all our family has access to life in all its fullness. That means not tolerating the huge gap between the obscenely rich and those existing without hope. That means actively working to bring the poor into a place of fullness and hope. Jesus validated his ministry by his preaching to the poor and outcast and his service to those most in need. Those of us who claim to be his disciples dare not do less. This entry was posted in Hunger & Poverty, Quotes, Spirituality & Religious Writings and tagged discipleship, faithfulness, God's will, Gospel of John, hope, hunger, Jesus, life in all its fullness, Oscar Romero, poor, starvation on August 7, 2014 by Ray Buchanan.